BRRRRRRR! ‘Baby it’s cold outside’ is an understatement! It’s finally starting to feel like the holiday season and Metro Transit has holiday cheer to spread. Last week, our Celebrate the Season Holiday Music Concert Series continued with some great performances and two more are scheduled for this week! 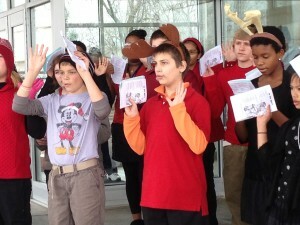 Last Wednesday, students with the Signal Hill Middle School Choir brightened the Belleville MetroLink Station. They sang a variety of songs celebrating the many holidays celebrated during the winter, including my personal favorite, Feliz Navidad. They also performed a special flute duet. As a former band-y I would like to say, Bravo! 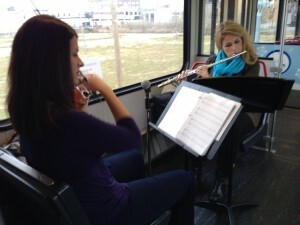 On Saturday, the Chamber Project St. Louis performed on the Blue Line aboard the Holiday Magic Train. The onboard concert began at the Fairview Heights Station at 12:12 p.m., headed to Shrewsbury and back to Fairview Heights. The instrumental duo performed holiday songs and drew a big crowd. MetroLink riders sat and stood around the musicians. There was not a frown on board, that’s for sure! Some riders began to snap, while others hummed and sung to the holiday tunes they recognized. Taking video of the duo on board was challenging; I can’t even imagine how difficult playing a flute or violin must have been for the musicians. This Friday, the Normandy High School Brass Ensemble will perform at the North Hanley Transit Center at 5 p.m.
Then on Saturday, you can hear the hot jazz sounds of Miss Jubilee and the Humdingers aboard the Holiday Magic Train. While they are performing, the Holiday Magic train will run on the Red Line between Fairview Heights and Lambert-St. Louis International Airport and back to Fairview Heights from 1:22 p.m. to 3:21 p.m.
Miss Jubilee and the Humdingers have been entertaining audiences around St. Louis and beyond since the beginning of 2008 with their exciting blend of authentic 1920s Hot Jazz, Swing, Rhythm & Blues and 1950s Rock n’ Roll. 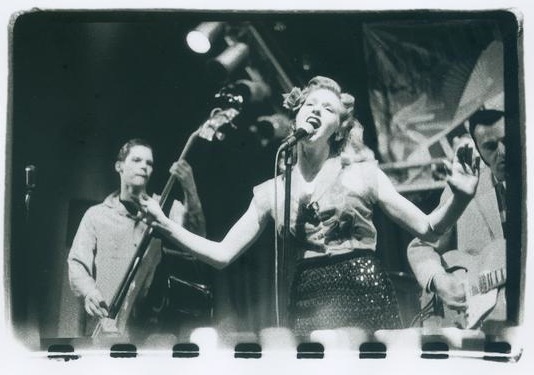 Fronted by a high energy female vocalist and backed up by a horn-fueled swinging’ rhythm section, Miss Jubilee and the Humdingers are a favorite among swing dancers and fans of all ages who enjoy uplifting and energetic roots music! This week’s performances promise to be a good time! The Holiday Magic Train is a partnership between the St. Louis Convention and Visitors Commission (CVC) and Metro Transit. The train travels on the Red and Blue MetroLink Lines to bring holiday cheer to thousands of area commuters. You can catch it through December 31.